Planning your wedding day can be quite daunting and knowing all the individual elements are taken care off helps makes the lead up to the day enjoyable. All-inclusive wedding packages are popular because they are not only more cost-effective, but also more convenient as we make all of the venue arrangements on your behalf saving you the time and stress of sourcing suppliers! We offer five different wedding packages which cater for the smaller wedding right through to larger wedding groups. From 2019, our Platinum wedding package also gives you complimentary Exclusive Use of the whole Hotel (subject to all bedrooms being booked by your guests). Small and Intimate - Available for all remaining Monday-Thursday dates (excluding Bank Holidays). - This package is based on 20 guests. Emerald - Available for all remaining Sunday - Friday dates (excluding Bank Holidays). This package is based on 50 daytime guests and 75 evening guests. Sapphire - Available for all remaining Sunday - Friday dates (excluding Bank Holidays). This package is based on 50 daytime guests and 75 evening guests. Additional guests will be charged per person. Our wedding packages are totally flexible - if you want to swap items / add additional items or change things around to suit your specific needs, we are delighted to oblige. After all, ever couple are unique so why shouldn't your big day be? If you are looking to get married this year, you may find our 2019 wedding packages suit your needs. 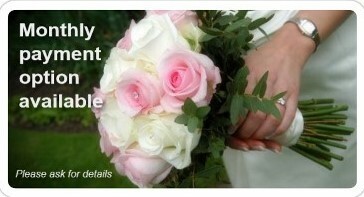 Check our Special Offers page as well as we do offer discounts for wedding booked at shorter notice. Realising that couples plan well in advance of the big day, we have also set our 2020 wedding packages and our 2021 wedding packages. 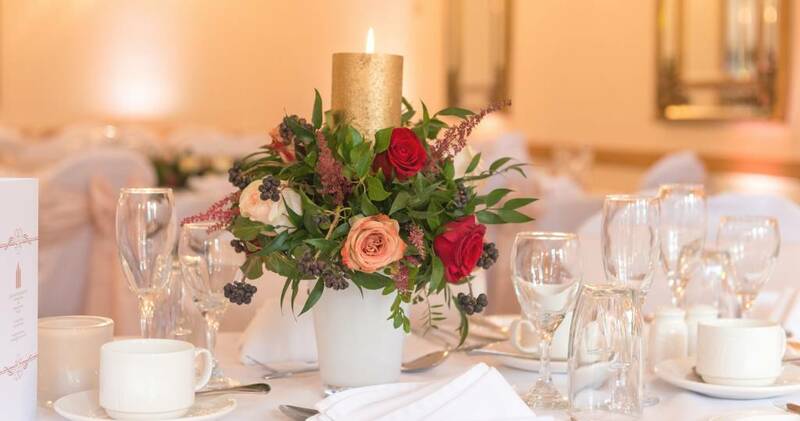 If our wedding packages don't meet your needs, we would be delighted to chat through your specific requirements and prepare a bespoke budget for your consideration. Our Platinum, Diamond and Sapphire wedding packages, give your guests a choice of three starters and two desserts on the day at the table for the wedding breakfast. They also include room hire, drinks reception, chaircovers, flowers for the hotel, menus, table plan, evening entertainment, evening refreshments and the Bridal Suite for your wedding night. The Emerald wedding package is suitable for those not requiring to offer a choice of wedding breakfast to their guests and are content to select a set menu for all guests present. This package does not include chaircovers or flowers (although these can be added at an additional cost if required). The Small & Intimate wedding package give your guests a choice of three starters and two desserts on the day at the table for the wedding breakfast. It also includes room hire, drinks reception, flowers for the hotel, menus, table plan and the Bridal Suite for your wedding night. Chaircovers are not included with this package although they can be added at an additional cost. There is an option with this package to add an evening disco and buffet or hog roast for those wanting to extend their celebrations into the evening. For those looking for a festive feel to their big day, our Christmas and Winter wedding package is for you! It is available from mid-November until the end of December each year. Increasing popular is our Afternoon Tea Wedding Package. Served on vintage china, your guests will be treated to a sumptuous selection of savouries, home-made cakes and lashings of freshly brewed tea and coffee. We also offer a Wedding Party package for those not wanting a wedding breakfast. This package can follow a wedding ceremony in the room of you choice or is perfect for those marrying abroad who want to celebrate their marriage with family and friends when they return home. We also offer easy payment plans so you can split the cost by paying monthly should you wish. There is no additional charge for monthly payments.